This photograph by local photographer Roger Gallienne, shows the signalman’s trusty motorbike ready for a prompt departure at the end of shift, as a train arrives from Havant in the capable hands of ‘Terrier’ steam locomotive number 32646. 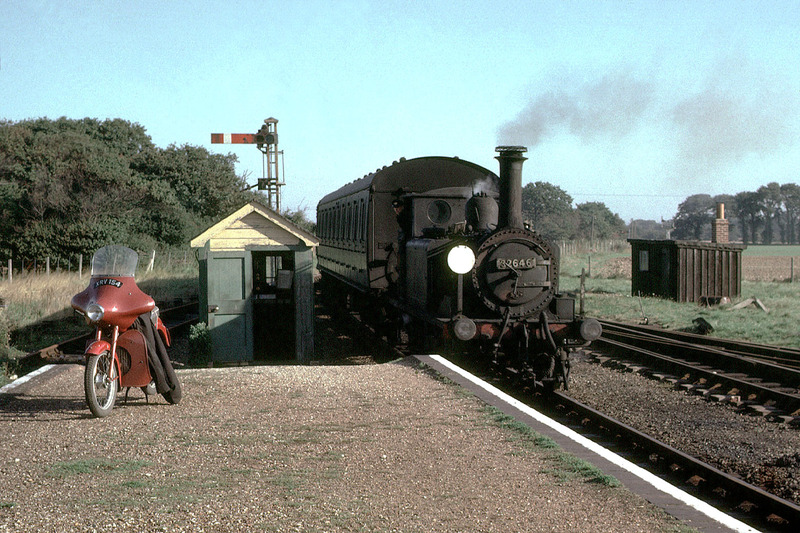 The engine which returned to the Hayling after the line’s 1963 closure for display outside of the ‘Hayling Billy’ public house, remaining for many years after ‘Time Gentlemen Please!’ had been called on the branch line itself. The Signalman however is nowhere to be seen. Does any Islander reader perhaps recognise the now ‘vintage’ bike, or know anything of its railwayman owner? (Photo: Roger Gallienne). Please see this article for more about Dougie (Sweeney) Todd. Thank you Pertyowl. I wonder who the owner was? My thanks go to John Watkins for solving the puzzle about the owner of the motorcycle. The owner was Dougie Todd, an ex Marines soldier. He had to use his motorcycle as he had to be at the station to receive the first and last trains of the day at the station.